It’s the post you’ve all been waiting for. I know you have. You want to know ALL about my trip to Nashville for Blissdom. Well, I don’t know that I will ever be able to process ALL that was Blissdom, but I will do my best to get some of it down. 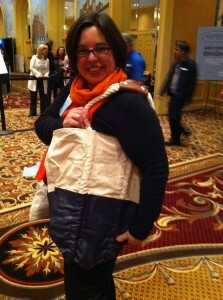 Without further ado, here is my Blissdom Recap – Top Ten Tuesday style. 1. 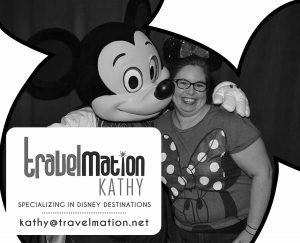 You can room with three people whom you have never physically met and have instant bonding based on the relationships you’ve built online. I had the BEST time just hanging out in the room with Hilary from The Other Mama (and Mint Julep Monograms), Mary from Giving Up on Perfect, and Kate from Savvy Little Women. These ladies are AWESOME and FUN and HYSTERICAL. There my have been crying due to laughter at some point. 2. The women attending Blissdom were perhaps the most giving group of people I’ve ever been with. There were people there from all walks of life with all different ranges of experience and with all different abilities. ALL of them were willing to share. Willing to share their knowledge. Willing to share there fun. Willing to share their snacks. Even willing to share their jewelry. It was AMAZING! And comforting. And humbling. And loving. 3. Ohamanda is a FABULOUS driving partner, well passenger. We decided to drive up from Atlanta the night before to avoid driving in ice first thing in the morning. Amanda kept me laughing and awake for the entire drive. Then, she introduced me to MANY folks at the Wisdom Workshops so I didn’t feel quite so lost with all those mega bloggers walking around. Love her. 4. 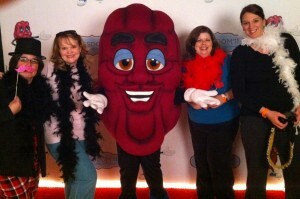 The sponsors of Blissdom were OUT OF THIS WORLD! We got a fun box before we even went to the conference. In it was popcorn from Conagra foods, which we thoroughly enjoyed and coupons for Freschetta pizza that the family enjoyed while I was gone. Hallmark gave us a great recordable book that I did for the Princess before I left. She listened to it every night. That doesn’t even include ALL the AWESOME vendors who had booths at the conference. I came home with so many goodies that I don’t even have them all unpacked yet. I think that’s an entire post in and of itself. 5. There is SO MUCH I DON’T KNOW about blogging. I heard terms I’d never heard before. I saw so much on the first day that I had never seen before that I was COMPLETELY OVERWHELMED! But, as the days progressed I understood more and was given many resources to help me figure it out. What I REALLY learned this week is how much I don’t know. And that challenges me. I’m excited about learning more over the next year and returning being able to go into the more advanced tracks. 6. If you stalk follow around the Lands End rep, you will end up winning something from Lands End. Look at this AWESOME bag I won by reading a post on Twitter and showing up at the right place at the right time. I also won a shirt for My Sweetie. In addition, I made a new friend with the Lands End PR rep. She’s so very nice. 7. Twitter is KING of the blogging world. Never in all my days have I seen so many smart phones. And, they were all out ALL THE TIME. If you weren’t tweeting it, it wasn’t happening. At least that’s what I felt like. In fact, my Twitter thumb was TIRED after the conference. As in, it was sore. Seriously. 8. 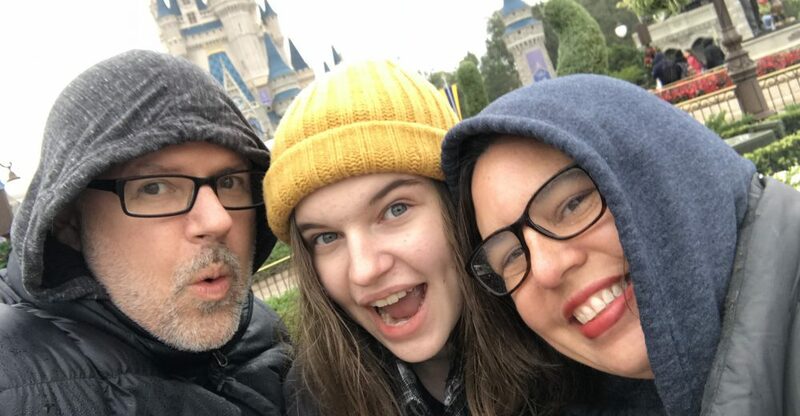 I got to room with (well, even share a bed with) Mary, whose post about weight loss literally changed my life. Her openness and vulnerability online translated wholeheartedly into real life. It was a pleasure to spend time with her and our late night conversations have formed what I hope is a life-long friendship. 9. Massive pajama parties are tons of fun. 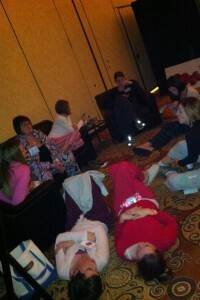 There is nothing like walking around a huge hotel in your pjs to go eat pizza, dance and get a massage. We played telephone (yes, that childhood game) and LAUGHED hysterically. 10. Finally, I learned that my family can survive without me. They missed me and I SERIOUSLY MISSED them, but they survived. I will say that My Sweetie had a very relieved face when I walked in the door. He was also extremely thankful for all the preparation I did before I left. We used the iPhone Face Time for the first time. I LOVE that technology as it allowed me to give the Princess kisses each night. Although, I think it made me miss them more being able to see them. That’s a quick recap of my trip to Nashville for Blissdom. Was it everything I learned? Nope! Was it everything that happened? Nope! Was it all I’ve processed so far? Pretty much. Thanks my friends for indulging my Blissdom posts over the last few months. Hopefully, they are coming to an end. However, integrating all that I learned into the blog is just beginning. 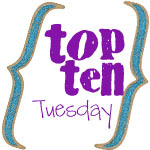 Linked to Top Ten Tuesday at Ohamanda and Blissdom Recap Carnival at Musings of a Housewife. 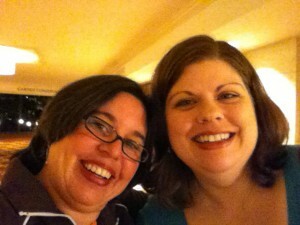 The fabulous @oohamanda and I made it to Nashville LATE last night. We decided to come up early to beat the snow and we are SO GLAD we did! 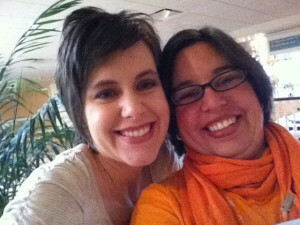 We are now hanging out at Blissdom, and I am already OVERWHELMED by all that there is to know. Whew! Trying to make it better for you friends. Trying to make it better. We’ll see if I’m learning anything over the next few weeks!